My dad had a lot of Marriott points so we stayed at the only Marriott in Belgium! 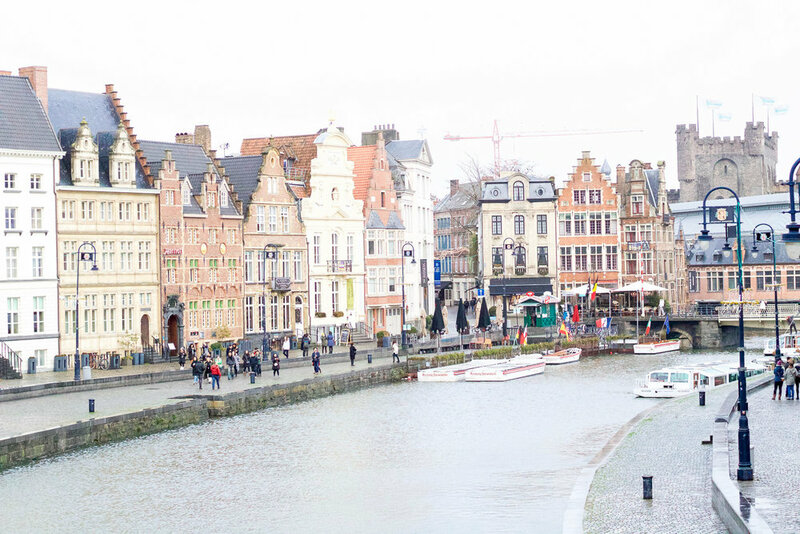 I had never heard of Ghent before, but it is such a gem of a town! 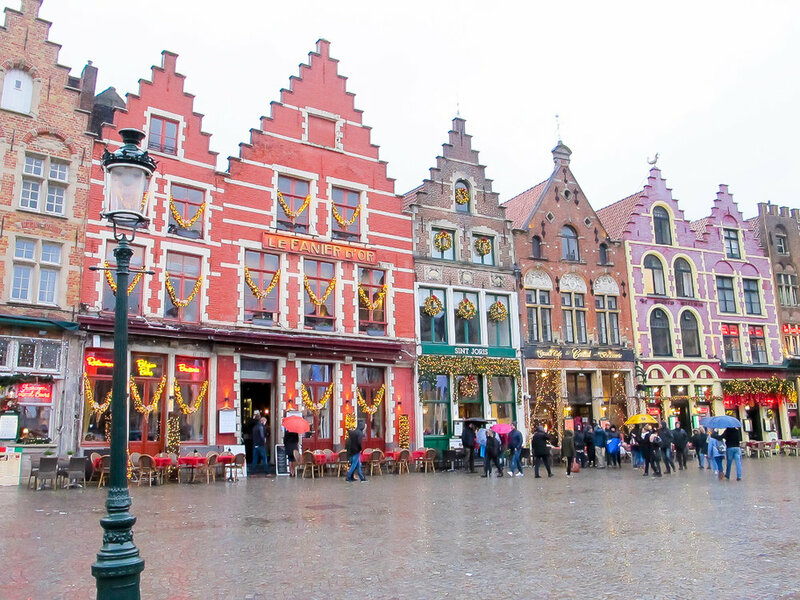 Located between Brussels and Bruges, it was the perfect location for us to explore the country. Ghent was extremely beautiful and looked like a storybook town. The Marriott was located right in the middle of everything, right on the river and perfect walking distance to everything. We really lucked out with this hotel. They couldn't have been more accommodating and it was a very nice hotel as well, with an amazing breakfast! Austin and I never stay at hotels in Europe and usually opt for the more affordable airbnbs but we both said we might have to start staying in hotels because we were so spoiled at the Marriott! We traveled throughout Belgium by train and found it so easy to navigate. We even flew into Paris and took a train to Ghent- we had to connect a couple times but it really wasn't difficult at all. The trains ran so often that we didn't even need to look up times when we did our day trips, just make sure to head back before midnight! Ghent was such a unique and unexpected city. It's not as busy as Brussels or touristy as Bruges. We seemed to have caught it at a very interesting time as all of the college kids were gone (it has over 40,000 students) and all of the Christmas decorations were still up. A win win really (other than it being quite chilly). Our hotel was right on the Leie River and overlooked the old town area. We were walking distance to pretty much everything and the city is super manageable on foot. 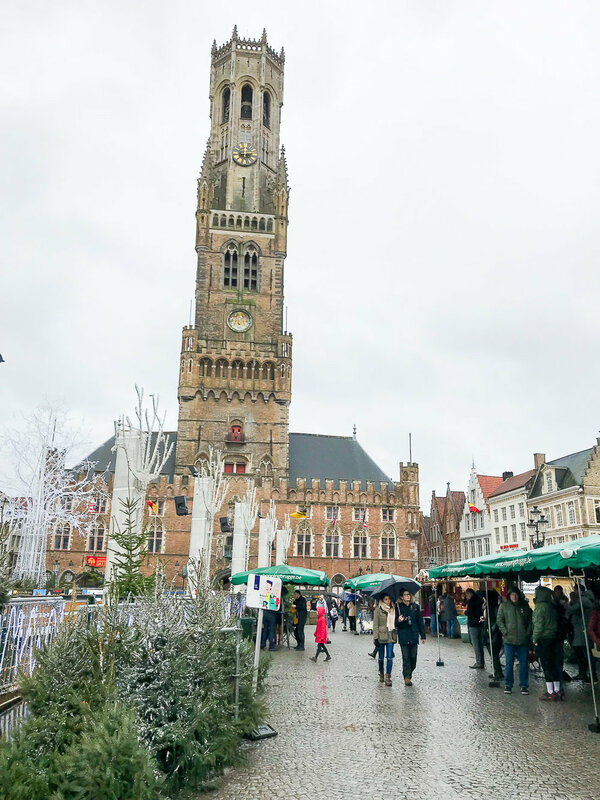 With all of our surroundings lit up and festive and the city seemingly to ourselves we made the most of our short stay in Ghent by drinking beer and mulled wine, chocolates and waffles and plenty of fries. The Christmas markets are worth the trip itself and I definitely recommend them to anyone thinking of a winter trip. 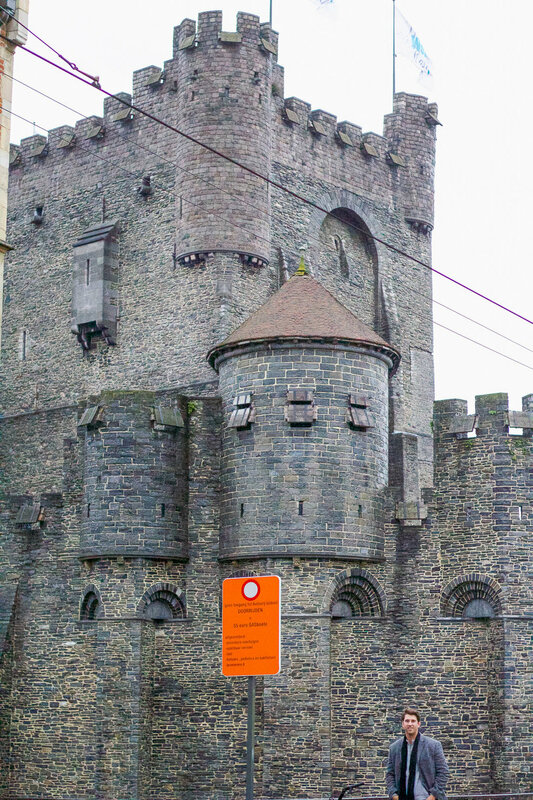 Gravensteen Castle - "The Castle of Counts" (in Dutch) sits in the middle of Ghent and you can tour the large, medieval castle as it tells a story through each of the rooms. The BBC show White Queen has used the inside and outside the castle as it's set! Definitely worth a visit! Christmas Market - Operating from Dec 8- Jan 7th. The smell of pine and greenery, an atmosphere of coziness and twinkling lights, tasty treats of pretzels, pastries, beer, mulled wine, and chocolate, and many gift options with every chalet offering something unique and different. We took a day to visit Brussels and with it being a pretty big city and it raining nonstop, we decided to take the double decker bus tour around the city. It ended up being a good way to see the different areas of the city and we definitely saw more than we ever would have on foot. We did take time to explore Grand Place, the most beautiful square in Europe. It was quite remarkable all lit up at night and it was jam packed with people. They had a huge nativity and Christmas tree set up in the center and in the summer the ground is covered in a carpet of flowers. 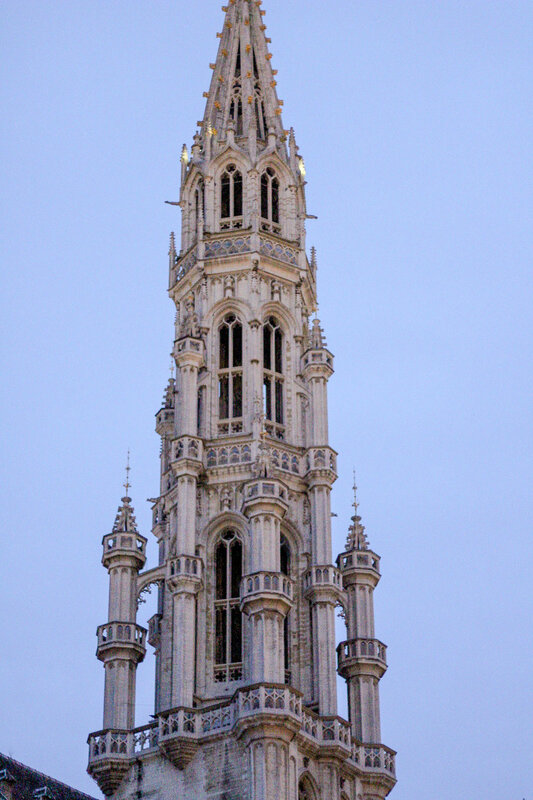 Brussels struck me as a bustling city with so much breadth; however, due to time and weather constraints I really don't feel like we got the true Brussels experience. So when time is short and it's pouring rain there truly is no better option than a bus tour. It certainly touched on all the highlights and gave us an idea of what the city has to offer in a general sense. No question, we will need to come back and visit over several days in the future. Atomium - The Atomium was constructed for the first post-war World's Fair in 1958. The nine spheres represent an iron crystal magnified 165 billion times. They represent the faith in the power of science and nuclear power. Bruges was adorable and the main reason I wanted to visit Belgium in the first place. It was idyllic and a town straight out of a fairytale- even in the rain! It was an absolute downpour when we arrived to town so we started our day in a small sightseeing van, which drove us around to get our bearings and show us what we wanted to walk back to. We also explored Bruges' Christmas market in Market Square where I bought some amazing Christmas ornaments. Like Abby said, Bruges is a picture postcard type of town. With the colorful houses and cobblestone streets it has the feel of somewhere you'd go to write a novel or poetry. With the decorations in full festive force we really experienced the place at an ideal time (other than the rain of course!). With the crowds much much slimmer than they'd be in the summer we took advantage of the freedom of Bruges and used the weather as an excuse to duck into every little shop or cafe to sample the local flavors and offerings. Of the three cities we visited in Belgium, Bruges is definitely one in which I'd itch to come back to sooner rather than later. And with it being so small, you really can DO it in a day! Stay tuned for multiple posts from our next stop, Paris! Have you visited Belgium? What did we miss? Let us know in the comments!